The Scappoose Indians football team likes to say its goal is to get a little better every week. And now, seven-plus weeks into the season, the goal is also about getting as good as the Indians can get for the Oregon School Activities Association playoffs. In a couple week, the Indians will be playing in the postseason for the first time in Class 5A. Scappoose appears headed to an Oct. 26 league playoff round matchup with the No. 2 finisher in the West Division. That would be La Salle Prep, if the Falcons defeat visiting Parkrose on Friday. The team with the higher OSAA ranking would play host to that Oct. 26 game, and that figures to be Scappoose. Win or lose on Oct. 26. the Indians would go into the 16-team 5A playoffs as either the No. 3 or 4 seed from Special District 1, with their first playoff foe and site to be determined by the OSAA rankings. But first comes Scappoose's final regular-season league game. It's a 5A Special District 1 West Division trip to Cleveland High in Southeast Portland. Scappoose and Cleveland will kick off at 7 p.m. Friday on the Warriors' artificial turf field at Southeast 31st Avenue and Powell Boulevard, a few blocks from the Portland Interscholastic League school. On paper, this game sizes up as potentially Scappoose's easiest of the season. Cleveland is 1-6 overall and 0-5 in league play. The Warriors are ranked 35th out of 36 5A teams by the OSAA computers, ahead of only Benson (Cleveland beat Benson, 56-28). Cleveland has lost some close games, though: 28-27 to Wilson, 20-14 to Franklin, and 21-14 last week to Hillsboro. The Warriors also lost by larger margin to better clubs, including 48-0 at St. Helens on Oct. 5. Scappoose comes into Friday's game off a 49-21 victory at Wilson. The Indians led all the way on a windy night in Southwest Portland. They are ranked No. 5 in 5A by the OSAA formula and rate as No. 7 in the coaches poll. The Tribe are 5-2 overall and 4-2 in their new league — a very good first year so far and in their move up from the 4A ranks. 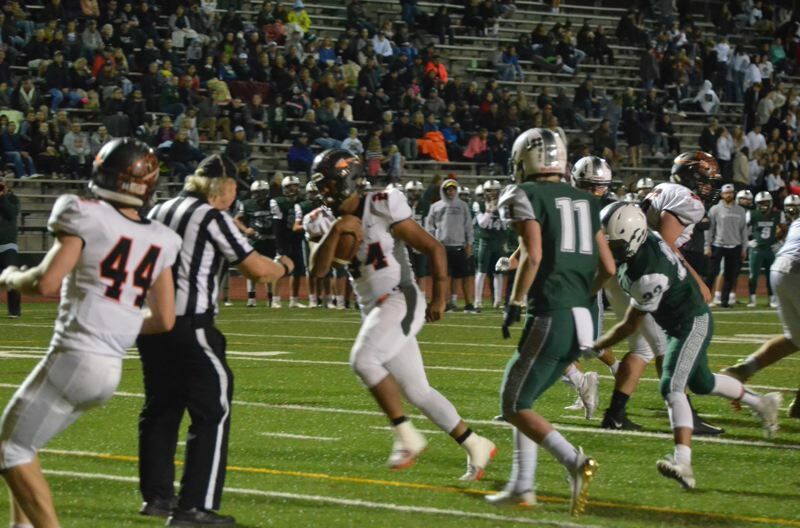 But Scappoose wasn't totally sharp in last week's game, which gives coach Sean McNabb and his players plenty to work on executing better this Friday. Items of most interest in that regard this week include cutting down on penalties and continuing to work on the passing game, especially vertically. The Cleveland game also could give Scappoose a chance to go to the bench, with some of the top line getting a bit more rest than usual. But the Indians want to show more precision, notably in the air, so they can rely on more than their strong running game in the postseason and give scouting opponents more things to focus on having to defend. "We're going to hang our hat on running the football, but we tried to throw the ball a little bit more (at Wilson), just because that's something we need to be able to do," McNabb says. "It was an opportunity to work on that." Junior Jakobi Kessi continues to operate the offense at quarterback, but last week the Indians were able to give freshman QB Luke McNabb some extra varsity game reps in addition to the action he's seen regularly on the freshman/sophomore team. "Right now, Luke's our backup, and we're trying to get him a few (varsity) reps and get him confidence, just in case something happens with Jakobi, because we'd have to have him doing well. Luke didn't start playing quarterback till eighth grade, he was always too big, so he was a lineman." With either quarterback, "we have to be able to stretch the ball vertically come playoff time," McNabb says. "Otherwise, and right now, teams are saying, 'We have to stop Scappoose's running attack,' and they're going to put seven guys in the box and make it harder for us. "So we have to be a little better on the perimeter with the run game and be able to throw the ball down the field, too. It's something we'll continue to work on and improve. "That's the whole thing, getting a little bit better all the time."